A version of this review was first published in the June 2008 issue of BOOKSELLER+PUBLISHER magazine (c) 2008 Thorpe-Bowker (a division of RR Bowker LLC). Jim Sharman relays the story of his life rhythmically, like a play or film. Childhood memories of boxing sideshows are cut between information on eras, people, productions, and moments of inspiration. Images from Sharman’s plays, life, and from popular culture also transport the reader into his experience. His writing is distinctly visual, poetic and personal. His recollections of people and moments that have inspired him (from Patrick White, to films like 2001: A Space Odyssey, to Dada and Pop Art) are endearing. Despite the few battles (with grief, a bout of depression, and the inevitable and sad end of relationships) Sharman has no complaints with life. His dark streak is transformed into unquestionable talent in daring shows, operas and films from Don Giovanni to Rocky Horror. His decision in later years to remain in Australia and assist the growth of quality theatre is admirable. The memoir is highly absorbing entertainment and has the potential to appeal to different ages and audiences, from those who will recognise suburban Australia, punk London, and hippie-era Tokyo, to those that only know Sharman through cult associations. Blood & Tinsel is an interesting and unique story of a personality with an original, genuine take on the world. Would sit well alongside Bruce Beresford’s or, Patrick White’s biography. 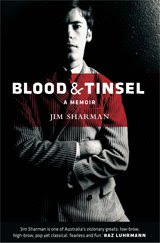 See my Q&A with Jim Sharman on Blood & Tinsel.